Get the results you love with this complete visual guide to quilting on your home sewing machine! From straight line quilting to beautiful free-motion techniques, learn new skills and build your confidence with more than 20 step-by-step stitch designs guides, from echoes and loops to swirls and feathers. 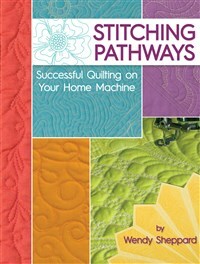 Also included are 4 beautiful sampler projects, detailed diagrams, stunning color photographs, and helpful “My Two Cents” technique tips from expert designer and author Wendy Sheppard to further your skills!